Usually more than 300 chickens are listed for adoption at any given time on Petfinder. Most of them have been rescued from neglectful circumstances; a few were surrendered when their people realized they couldn’t care for them. Some years ago, my family decided to get a flock of chickens so we could have fresh eggs. We promptly named them, and they became pets. These days, as people learn more about conditions in some sub-par poultry farms, an urban chicken movement is on the rise. 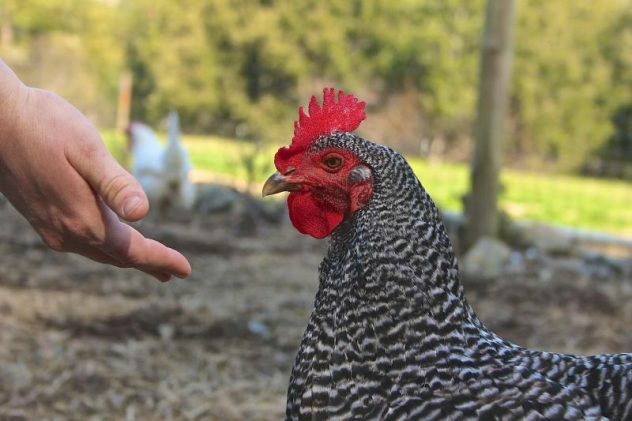 Some cities are loosening their long-standing bans on having chickens in backyards. If you decide that you want to raise urban chickens, the first step is to find out whether it’s legal to own chickens (and if so, how many) in your location. We lived outside of any municipality, so for us legality wasn’t an issue. If you find you can have a flock where you live, be aware that getting started isn’t cheap. You’ll need to provide a safe place for your chickens to sleep and lay eggs and building a coop can be costly. You can buy a ready-made one or build your own. There are many do-it-yourself designs on the Internet. If you feel creative, check out 10 Ways to Build a Better Chicken Coop. Within the coop, you’ll need nesting boxes that will encourage your hens to lay their eggs in them and not in some secret place. When we first raised chickens, we couldn’t understand why they weren’t laying. Eventually we found that they had been: 50 or so eggs were cached under a shed, and they ranged from tiny eggs when the chickens were first laying to normal-sized ones. They apparently liked the real estate under the shed better than the nesting boxes we had provided. Most communities won’t want your chickens to leave your property, so that means providing some kind of confinement – and remember, chickens can flap their way right over a chain-link fence. Chickens make interesting pets, and they aren’t dumb clucks. They have a remarkable way of communicating with one another, alerting to predators and even identifying what kinds of predators. Read more about this. They’re also being touted as good pets for children on the autism spectrum. The downside is that they can wreak some havoc in your flowerbeds, although they do help keep down the bug population. For more details about raising urban chickens, check out Wikihow. You can usually buy chicks in the spring at feed stores, but also consider adopting a homeless chicken on Petfinder. Being an animal lover, you’ll probably soon find that chickens have personalities and make fine pets.